Ducts are often dirtiest near the vents. If the air ducts in your home have mold, dust, bugs or worse, it may be time to consider a cleaning. While an intrepid do-it-yourself homemaker can perform some basic methods, a full duct cleaning might be better left to a professional. But regardless of who does the dirty work, don't necessarily expect a change in your family's health: The Environmental Protection Agency doesn't typically prescribe duct cleaning except in extreme cases, and it's usually not correlated to a change in overall health. One way to avoid a full air-duct cleaning is through a bit of preventative maintenance. Changing the air duct protective filters every two months prevents the accumulation of dust and dirt in the system and will improve air circulation ability. This can help bring down utility bills as well. If you suspect your air ducts are in need of more extensive cleaning, it's best not to venture too far into the system. 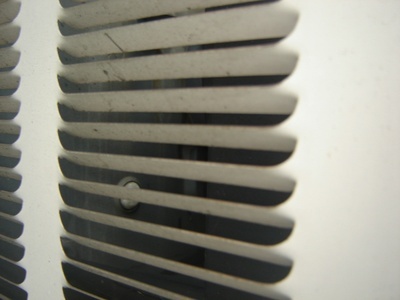 Because of how air ducts are designed, the dirtiest areas might also be the least accessible: near the vents. These areas are cleanable with a handheld vacuum cleaner, although it's best to make sure any loose pieces are firmly attached to the vacuum so as not to lose them deep in the air duct. If you're unsatisfied with your own efforts, professionals can clean your air ducts for you. Expect to pay between $500 and $1,000 for the service, but it comes at a hefty price for a reason: air-duct cleaning professionals have specialized equipment capable of cleaning deep within your system, far beyond the areas you can reach. Another common problem is the rotting or contamination of insulation that lines the air ducts. This cannot be replaced by the homeowner--it's best to call for a professional consultation. Mold is one of the most common reasons to have air ducts cleaned, and effectively killing it requires professional help. But before you take out your wallet, consider a professional diagnosis. A sample of the suspected spores can be sent to a laboratory, which can confirm or assuage your suspicions. If a substance isn't mold, a basic wiping-down of the surfaces will be enough to clean the air duct.